Learn the basics of potion making. Acquire one sample of wheat and one sample of blisterwort. Combine the ingredients at an alchemy lab to create a potion of Restore Health. 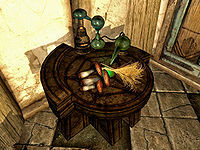 Ask any of the quest givers if you can use the alchemy lab located in their shop or inn, as the case may be. They will all consent with the same reply, "Long as you clean up. You know how to use it right? Mix a couple of ingredients together, see what happens. A little Wheat and Blisterwort makes a healing potion, if you didn't know. We have plenty of ingredients for sale, too." As indicated, if you don't have these ingredients you can purchase them from the quest giver, or if you prefer to save yourself the gold, wheat can be found on many farms or randomly placed in barrels, and blisterwort mushrooms often grow in caves. Once your ingredients are collected, approach the alchemy lab and select the wheat and blisterwort from your list of ingredients. To make a potion, each ingredient must share an alchemical effect. If you've sampled blisterwort in the past, it will be listed under Damage Stamina, as that is its first effect. However, it also has a restore health effect. Confirm the crafting of the potion and finish the quest to receive a freshly brewed potion of Restore Health. After you have brewed the potion, the category of restore health will be added to the Alchemy menu. The following empty quest stages were omitted from the table: 20, 100. On the PC, it is possible to use the console to advance through the quest by entering setstage TutorialAlchemy stage, where stage is the number of the stage you wish to complete. It is not possible to un-complete (i.e. go back) quest stages, but it is possible to clear all stages of the quest using resetquest TutorialAlchemy. This page was last modified on 20 October 2014, at 00:24.